Just a quick nail art post for you guys on this lovely Sunday! You may recall my stenciled star tutorial that I did for my Fourth of July nails. I used a star hole punch for those, and when I was at Michael's recently I picked up a similar punch but with a heart instead. I used the stenciled technique in the tutorial for all of these nails except my ring finger accent, which was freehanded (and I think it shows). I used the same colors for this look as I did in my bright Easter floral nail art. All Zoya polishes: Jacqueline, Malia, Arizona, Robyn, and Audrina. It's interesting how different the two manicures look despite including the same colors. Just goes to show a small nail polish stash can go a long way when used in nail art! I wasn't crazy about this right after I finished it, but it did grow on me a little. I think next time I will take extra care to choose very opaque polishes to use in the sponging. I agree that the two color combos look extremely different for having used the same polishes, pretty either way. This is adorable, thanks for showing how much you can do with the same colors. You Are so BRILLIANT!!! Love your every single nail art!!!!!!!!! I absolutely love these! I have a yellow shirt with tie-dyed hearts on it that this totally reminds me of. I love this look a lot! It is so cute! I like that they are not completely opaque. It gives it a watercolor look. So purdy! This looks amazing! 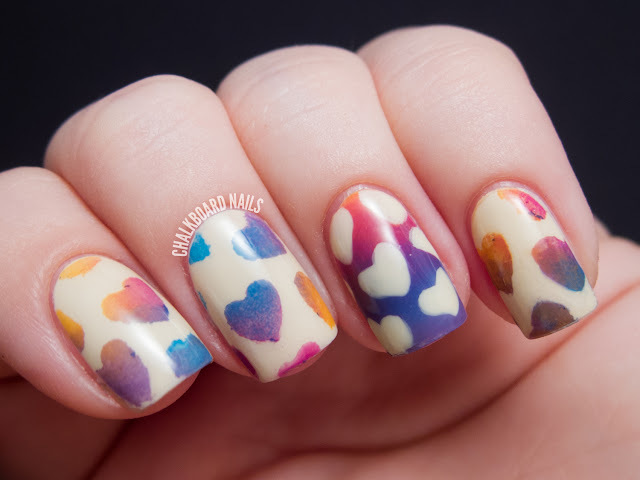 I am in love with every aspect of this mani, especially the colour combination. It looks like a painting, love! So amazing!!!! I really love it! I live that they don't look so perfect, with clear lines. It really reminds me stencils from street. Nice! Simple creations that leads to huge creativity.